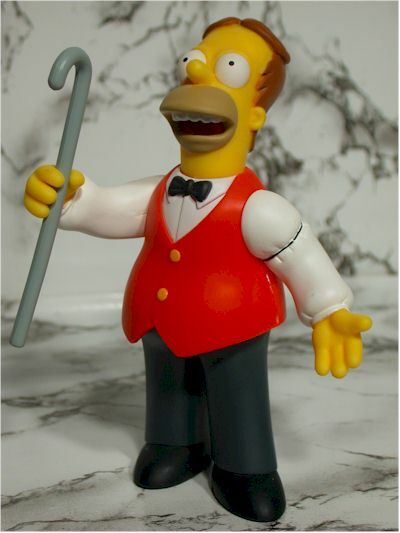 The first review of the new year, and some how it's fitting that it's the latest figure from the Playmates Simpsons line - the Be Sharps Homer. 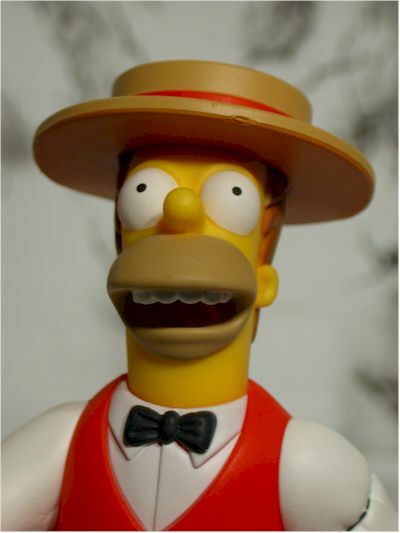 This Homer variation is based on the episode in which several of the boys formed a barbershop quartet. Their singing led to fame of course, and to the inevitable crash. 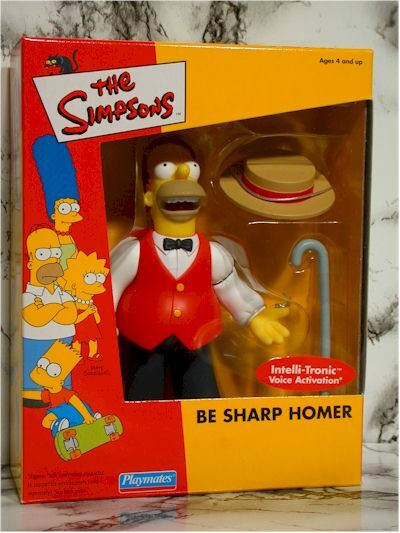 We are going to get four Be Sharps figures, and each is being offered as a special mail away. 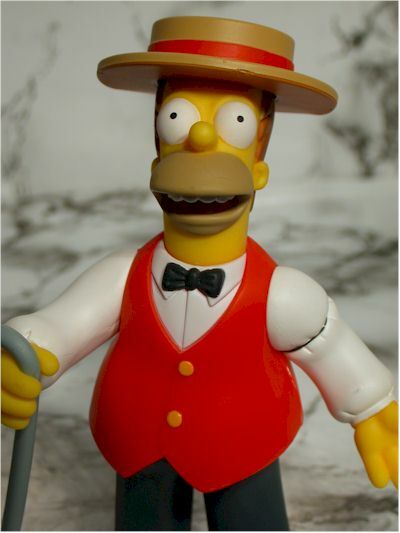 Purchase any four Wave 10 figures (including Hank Scorpio), send in the POP's along with a check for $5, and Playmates will send you a dapper Homer! It's that simple, and the offer is good until the end of 2003, so you still have plenty of time to get in on the deal. Next up is Be Sharp Apu, who will be offered as a mail in with wave 11. Wave 11 is just now hitting stores, and should be everywhere by the end of the month. Unlike Cooder and Sinclair, we get the best kind of packaging with this mail away - the small box. This box matches up with those used for the Toyfare exclusives of two years ago, and looks great next to them on the shelf. If you're an opener, but would like to save the package, have no fear for it's completely collector friendly. Sure, there are a few twisties, but you can always put them back easily. 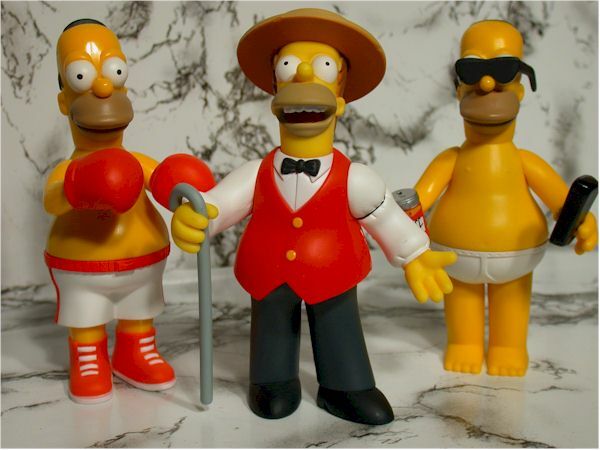 My favorite Homer variation was Boxing Homer. Please notice the use of the term 'was'. This figure blows the others away, and is a perfect example of when this line is in top form. Rather than a static figure, with a zombie look, we get a terrific action sculpt. The legs and arms are posed to convey a feeling of movement, as if Homer is caught mid-melody. 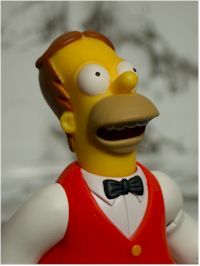 It's always nice to see Homer with hair too! I've included a shot at the end showing this Homer with a couple others, and the extra value the sculpt provides is pretty obvious. And here's an important note - this is NOT the same body, legs or exact stance that Apu will have. Let's hope that continues with the final two. While the paint ops aren't terrible, they aren't perfect either. And many companies are really raising the bar on exceptionally detailed, quality paint ops. The colors of his clothing are all clean and consistent, but there's some problems along the hair line with bleed and overspray, and there's a couple spots on his hat and around his vest seam missing paint. Still, this figure has more detail and color than most in the WOS series, right down to the arm band, and they've done a decent job with it. No surprises here - neck, shoulders, waist. Of course, we don't expect that to change during the life of this line. Fortunately, the excellent posing helps overcome some of the shortcomings of such limited articulation. You get two accessories here - his straw hat and his cane. Both are brand new at this point, although we'll see them re-used with the other Be Sharps. The hat could have had some greater detail, but it fits on his head nicely, and the cane fits perfectly in his right hand. Getting two new accessories with a mail away figure - pretty much a freebie - is not bad at all. Five bucks? You can't do better than that for such a cool figure. Sure, you had to buy four figures to get him, but weren't you going to buy four of the wave 10 figures anyway? Yep, some of the pure MOCer's complained, but now they have a few loose figures around to make their collection look even better. This is damn close to a four star figure, and only the slightly weak paint ops holds him back. He's one of the coolest figures in the line, and I love episode specific variations, particularly those that can go in sets like this. I'm looking forward to the rest of the set, and I'm hoping we see more about the rumored Be Sharp's Rooftop playset at Toy Fair. - Aisle Sniper has a number of the wave 10 figures available for $7 each plus shipping. - Big Bad Toy Store has a set of six wave 10 figures (which includes Scorpio) for $40 and $5 shipping. That's about $7.50 each including shipping.